No visit to Iceland is complete without a dip in a geothermal pool. 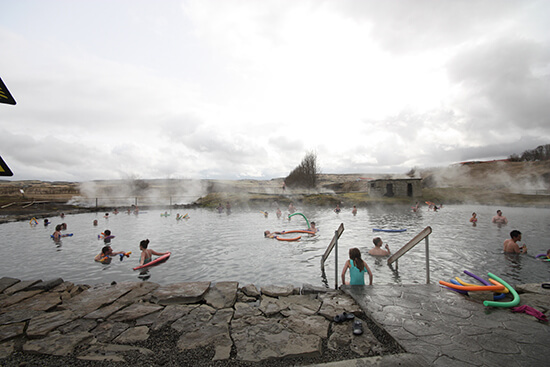 Since settlers first discovered the glacier-capped island, the naturally-heated lagoons have offered bathing solutions and provided a centre for leisure and relaxation. Everyone knows the Blue Lagoon; the healing waters and large silica mud-lined pools attract hundreds of visitors every day. Slipping into the milky, pleasantly bath-temperature water when the air temperatures are biting is as brilliant as it is surreal, and an experience I certainly recommend. 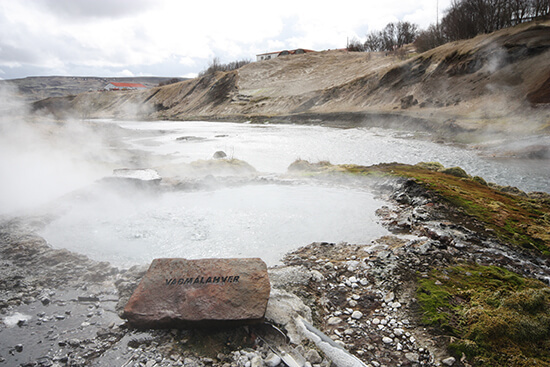 Unlike the silica-impregnated, pungent waters of the Blue Lagoon (an undeniable sulphurous whiff lingers in the air), the hot springs that feed the Secret Lagoon produce dazzlingly clear freshwater. Sure, it can be a bit of a shock when you look down and can see your bikini-body in all it’s wrinkly ‘I’ve been in the bath too long’ glory, but you can also see the natural black pebbles beneath your feet. The whole experience feels more natural than the slightly gimmicky Blue Lagoon. There’s no ‘swim-up’ bar, no attendants handing you mud to smear on your face, and certainly less selfie sticks to dodge. Though the Blue Lagoon offers remedial mineral-rich waters, the serene Secret Lagoon is the place to get your mindfulness fix. Even reaching the Secret Lagoon feels like a bit of an adventure. Follow empty roads to Fludir, passing steaming geyser fields and crossing bridges over thundering turquoise waterfalls. Unlike the grand entrances of the Blue Lagoon, you’re greeted by a small building that blends into the remote landscape. Hot pools bubble and hiss around the main lagoon, producing steam that shrouds the bathers – visit early in the morning to convince your inner explorer you’ve just discovered your own private pool. The Secret Lagoon’s charm lies in its intimate experience. While there will almost certainly be other visitors, the masses haven’t quite found out about this natural gem yet so you won’t be sharing this modest pool with coach-loads of tourists. The pool isn’t huge, but there’s always enough room for you to float towards a corner without rubbing too many shoulders. It’s the perfect spot to lie back and relax – with the help of the noodle floats provided – and sip a cold beer from the bar. Wait – before you cry ‘nerd!’ and stop reading, this is far cooler than it sounds. Straddling the mid-Atlantic ridge, where the North American and the Eurasian tectonic plates pull apart, Iceland’s staggering landscapes have been shaped by its unique geography. Glacier-capped volcanoes tower on every horizon and boiling water from deep in the earth erupts from fissures in the ground. Sometimes this produces immense geysers, and other times it creates gently bubbling hot springs. Cue: natural swimming pools. Wooden boardwalks let you get up close to mini hot pots and safely explore the steaming fields that surround the Secret Lagoon. Stopover in Iceland, or book one of our Iceland holidays to this magnificent isle, when you make an appointment with a Flight Centre Travel Expert.